As the University of Texas System prepares to name its next chancellor, it is poised to break the mold. The two remaining candidates to replace outgoing Chancellor Francisco Cigarroa — Admiral William H. McRaven, commander of the United States Special Operations Command, and Richard Fisher, president and CEO of the Federal Reserve Bank of Dallas — are neither a product of state politics nor of academia, the typical backgrounds of the heads of university systems in Texas. While both men are still candidates — news first published last week by Texas Monthly’s Paul Burka — McRaven appears to be the favorite for the position, a source with knowledge of the chancellor search said, adding that an announcement could come in mere weeks. Gov. Rick Perry initially encouraged the hiring of Texas Health and Human Services Commissioner Kyle Janek, but his odds have waned significantly, the source said. James Huffines, a former chairman of the UT System board, described the two remaining candidates as "extraordinary" and shrugged off comparisons to other chancellors in the state. “I don’t think the UT System is comparable to any other system in Texas,” he said. While it's not a mandatory track record, most current university system chancellors in Texas have previous experience in state politics. Four of the six major Texas university system chancellors are known for their previous service in Texas politics: former Comptroller John Sharp at the Texas A&M University System; former state Reps. Brian McCall at the Texas State University System and Lee Jackson at the University of North Texas System; and former state Sen. Robert Duncan at the Texas Tech University System. Chancellors with strong academic backgrounds have been the exception. Currently, only Renu Khator at the University of Houston System and Cigarroa, who plans to return to pediatric transplant surgery following his resignation, fit that bill. While neither McRaven nor Fisher are steeped in academia or politics, those arenas are certainly not foreign to them. McRaven, a Navy Seal best known for coordinating the successful operation to kill Osama bin Laden, holds a bachelor’s degree from the University of Texas at Austin and a master’s degree from the Naval Postgraduate School. 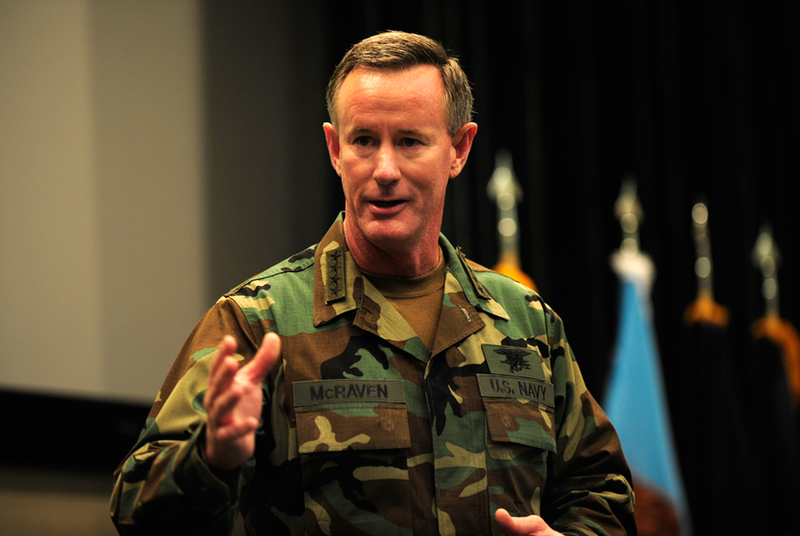 In 2011, following a distinguished military career, McRaven was appointed by President Obama to be the ninth commander of the U.S. Special Operations Command, which is headquartered in Florida. His most recent public involvement with UT was this past spring, when he delivered a well-received commencement speech at UT-Austin — one that has been viewed more than 2 million times on YouTube. He was also named a distinguished alumnus of the university in 2012. A source familiar with the chancellor search said McRaven was being eyed for the position well before the speech, not as a result of it. Fisher was appointed to his current position at the Federal Reserve Bank of Dallas in 2005. Prior to that, he was vice chairman of Kissinger McLarty Associates, a strategic advisory firm chaired by former U.S. Secretary of State Henry Kissinger. In the early 1990s, Fisher vied for one of the state’s U.S. Senate seats. He lost to Kay Bailey Hutchison, who would go on to hold the position for two decades. "I labored briefly in the vineyards of partisan politics," Fisher said in a 2004 news release, "but all it yielded was prune juice. I was a lousy politician." While not a graduate of a UT institution — he holds a bachelor’s degree from Harvard University and an MBA from Stanford University — he has developed ties to the community. Fisher previously served as an adjunct professor at UT-Austin’s LBJ School of Public Affairs and as a member of the University of Texas Investment Management Company. Elizabeth Heise, the chairwoman of the system’s faculty advisory council, said the candidates’ lack of credentials in academia was not necessarily an issue. Huffines said that there was no set formula for what makes a successful chancellor and that the system has been run by men of varying backgrounds, including business, political and academic. Huffines added that there are six traits a great chancellor needs: leadership ability, a clear vision for the system, management capabilities, a background in finance, an ability to build relationships in the state and federal governments and a thorough understanding of the academic community. Correction: A previous version of this story said Kay Bailey Hutchison had served in the U.S. Senate for a decade. She served for two decades. Disclosure: The University of Texas at Austin is a corporate sponsor of The Texas Tribune. James Huffines is president of PlainsCapital Bank, which was a corporate sponsor of The Texas Tribune in 2012 and 2011. A complete list of Texas Tribune donors and sponsors can be viewed here.